Field trip: Ponsse machines in action! http://www.tech4effect.eu/wp-content/uploads/2019/02/1812-ponsse-forwarder-dsc00722.jpg 284 347 TECH4EFFECT http://www.tech4effect.eu/wp-content/uploads/2016/10/Tech4Effect-logo-transparente-Kreise.png TECH4EFFECT2019-01-17 11:08:072019-02-19 11:10:16Field trip: Ponsse machines in action! 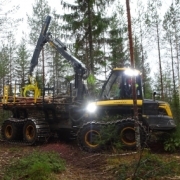 In cable-assisted timber harvesting forces on the cable are enormous. But how strong exactly are they? 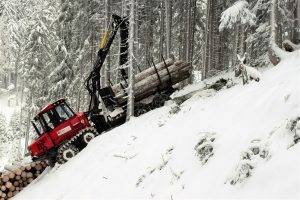 As part of TECH4EFFECT WP3 , Markus Engel and Andreas Mayerhofer (ÖBf – Austrian Federal Forests ) and Thomas Holzfeind from BOKU carried out investigations on winch assisted harvesting machines in the ÖBf forest district Flachau (Austria). 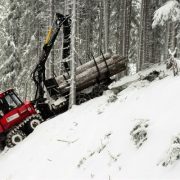 They recorded the inclination of the machine during operation on steep terrain using a tilt sensor installed on the winch assisted Valmet 840TX forwarder. 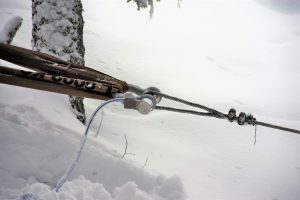 At the same time, the tensile forces in the cable were measured with a load shackle. In addition, all activities of the machine were recorded by an action camera, which will be analysed later together with inclination data and the tensile forces. The results are intended to shed light on the tensile forces that occur in the cable of the machine as a function of the work processes and the machine inclination. Follow us on LinkedIn or Twitter and subscribe to our newsletter to be among the first to know the results! Have a look at the full programme! Stakeholder feedback collected during this event will help to shape BBI JU’s future role in the bioeconomy!